The greatest engine to generate real wealth is saving and investing. And the best way to ensure that your default is saving and investing is to automate the process. Pay yourself first, and your savings will grow exponentially. Wealth management is based on the idea that very small changes can yield enormous gains in your family’s finances. This process, both easy and simple, is worth millions. Unfortunately, only a tiny percentage of American families take advantage of the tools available to implement this automated technique. All income should flow into your joint taxable investment account. Make saving and investing your default. Putting all of your money in this account helps ensure that you move only the money intended for some other purpose into a different account. For working families this means an automatic deposit of paychecks into their joint account. 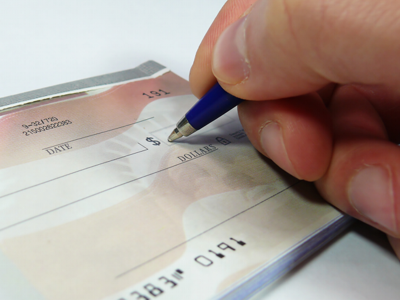 Banks will try to entice you into setting up automatic payroll deposit into their checking account. They will offer you additional interest if you do so. Resist. The additional interest is not worth the failure to not only save but to save and invest. Your taxable investment account should be the default. For retired families this means an automatic deposit of Social Security checks. It also means their required minimum distributions (RMDs) from their individual retirement accounts (IRAs) should be deposited first into this account. From this account you can then withdraw what you need for daily expenses. Do this by setting up a regular transfer of funds from your joint investment account to your checking account. Make sure the transfer matches the amount you have allocated in your budget, ideally 65% or less of what you need to support your lifestyle. The other 35% should remain in your joint taxable account, much of it to be invested. Gift appreciated stock from this account and leave enough cash to reinvest and replenish the value. This plants the seed for future gifting. You save on capital gains tax, and with your new purchases you can rebalance your portfolio. Another part of what remains is the 10% you have designated for unknown unknowns. In the ideal world, this money will not be needed, but few families can anticipate every possible expense. Each stage of life presents new challenges. Having the financial margin to absorb some of life’s shocks is simply wisdom and offers financial peace of mind. Because the time horizon for this emergency money is unknown, invest it in a balanced portfolio. If unused, your emergency money will double in 7 to 10 years and provide a greater safety net for your family. If you have to dip into this fund, keep track of the amount. If it approaches the full 10% every year, you are using your emergency money to extend your budget, not simply for unanticipated expenses. The less you use this account, the more quickly you will reach financial independence. These funds are mixed with your other taxable investment savings and continue to grow your net worth. If you are meeting all of your expenses without any major surprises, these funds can be used to purchase a home, start a business or for additional charitable giving. Another portion of what remains in your taxable investment account will be the 5% you are specifically designating as taxable savings. Because this 5% gets mixed in with charitable giving that is being invested and your unknown expenses, the entire portfolio should be balanced. If an emergency arises, any portion of the portfolio could be sold to furnish the needed funds. Similarly, when you want to gift appreciated stock, any portion of the portfolio could be gifted. The last portion might be the 10% for funding your retirement accounts each year. Many people put this money directly into a retirement account as part of the payroll process through a pretax deduction. If that is the situation, you don’t need to flow anything through your taxable investment account. But you may want or need to fund your retirement outside of a payroll deduction. One example is funding your Roth IRA each year. In this case you may want to collect the money in your taxable investment account and then transfer it to a Roth account. If you want to fund a Roth IRA account for the maximum $5,000 (in 2010), you could transfer the entire amount once during the year or set up a monthly transfer of $416.66. The money from your paycheck would provide the liquidity, either letting it build up throughout the year or supply the funds for each month’s transfer. Busy people forget to make the necessary transfers each year. That’s why a monthly transfer is preferable. Saving and investing should be automated so it occurs regularly without any additional effort. Whatever is in your checking account you are likely to spend. Whatever is in your investments you are less likely to spend. Automating the process of saving and investing is like damming a river to form a reservoir. The alternative is the manual process of hauling buckets of water from your stream to a water tower. You will never grow rich by hauling buckets, and it’s much harder work. No matter what income you have, you probably already have enough to grow rich. Saving and investing just $10 a day builds a million dollars over your working career at average market returns. You build wealth by what you save and invest, not by what you spend. Automating the process of saving and investing grows your wealth while you sleep.